I posted a poem called "The Peppermint Men" on my blog ages ago (actually I guess it was just 2012). I'd found it somewhere online drifting around the Masonic-sphere, and it was clearly attributed to an unknown author. Some of you may have enjoyed the post on my site. Imagine my surprise when I learned that the poem has a clear author, and in fact the version I posted was altered. I am grateful to my good Brother Richard Swan, who brought the proper authorship and correct version to my attention. Of course I agreed to make the correction. Here's what Bro. Swan told me.
" 'The Peppermint Men' was created by Gladys Tracey. Gladys created this and read it out for her own Ladies Night in 1986 and it was very well received and appreciated at the time and for a long time after. In fact many asked for copies!" "The version you have published is not an exact copy with a few lines being altered. I would dearly like to publish the original version with Gladys name clearly defined as the author. Gladys died 3 years ago, she is sadly missed and we would all love to think that her memory and prowess as a poet could live on." "I have the full permission of my friend and brother, W-Bro Alex F Tracey, PPJGW of Blackwater Lodge 1977 to make contact with you and to ask that you kindly edit the entry on your site to give credit to the correct author." It is not often you get to make a connection with a part of the Masonic world that has made a contribution Masons all over the world love and appreciate. 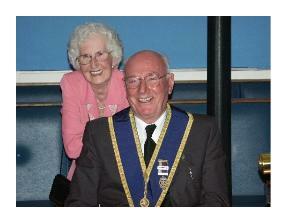 I am proud to give proper credit and join the Brothers of Blackwater Lodge 1977 in celebrating Gladys Tracey. I have removed the version of the poem I had posted, and I include the corrected version below. I pray that the poem will reach a wider audience and new generations of Masons will gain appreciation for it. I repost the poem here, now, with the permission of W. Bro. Alex Tracey. If you want to post or publish it yourself, please take care to give due and proper credit, as well as obtain permission. Thank you Brothers of Blackwater 1977 for sharing. Herewith, is "The Peppermint Men", by Gladys Tracey. “It will only mean one evening out, and once a month” said he. He dines out fairly often, superb meals, mainly roast. I sit and watch the ‘goggle-box’ and eat my beans on toast. His suit well brushed, his case in hand, oh dear, I wish he’d go. I think he’s going crackers, and I blame the Peppermint Men. That’s nice, I thought, with his poor legs, he’s better sitting down. I scribbled through a pad or two as I tried hard to think. I threw away six ballpoint pens as they ran out of ink. That it’s the best night of my life, I hope it’s yours as well. Thank you so much for all your hard work and efforts in ensuring that this is out in the public domain with the author correctly credited.